Ignatius Matthew Michael S. Gnanapragasam passed away peacefully in his sleep at Father Lacombe Nursing home in Calgary, Alberta on January 24th, 2019, at the age of 88, after struggling with Alzheimer’s and Dementia for the last two and a half years. Ignatius, the beloved son of Peter and Grace (nee: Abrahams) Gnanapragasam, was born on September 19th, 1930 in Trincomalee, Sri Lanka. As a child and young man, he lived with his many brothers and sisters in various parts of Sri Lanka including Batticaloa, Jaffana, Kandy, Galle and Colombo. 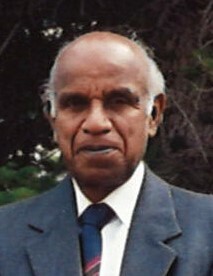 After completing Technical College in Sri Lanka, Ignatius, went on to work at Somerville and Co. in Colombo for 34 years. During that time, he got married to Clare (nee: Coomaraswamy) and became the father of Peter and Nicholene Gnanapragasam. In 1984, following the challenging situation in Sri Lanka, Ignatius and Clare made the courageous decision to immigrate to Canada. Coming to Canada at that late age in his life was fraught with countless challenges. However, Ignatius with his wife’s help, succeeded through hard work and careful stewardship to secure a comfortable life for his family. Ignatius’s life was one of self-sacrifice. He did very little for his own comfort and was always prompt at helping his wife and children. Most importantly, Ignatius was always there when they needed him. He was someone you could always count on. Ignatius enjoyed gardening, long walks and spending time with his dogs and reading and passed on his love of books and learning to his children. His favorite time of the year was Christmas where he enjoyed making elaborate nativity scenes. As a lifelong Catholic, he went to mass regularly until his illness made this impossible. Ignatius prayed the rosary daily and was always strengthened in life by his faith in God. He is survived by his wife Clare, children Peter and Nicholene, brothers; Peter Gnanapragasam (Canada), Ray Gnanapragasam (UK), Angelo Gnanapragasam (UK) and Regno Gnanapragasam (Sri Lanka), and his sisters; Julia Christopher (Canada), Philomena De Silva (UK) and Polly Gnanapragasam (UK). May Ignatius rest in peace in the loving hands of Christ.